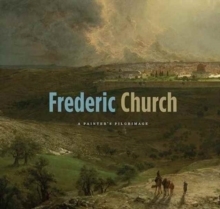 A beautiful overview of fascinating paintings of the classical world and the Holy Land by a beloved American artist Frederic Church (1826-1900), one of the leading painters of 19th-century America and the Hudson River School, also journeyed around the globe to find fresh inspiration for his highly detailed compositions. Among Church's lesser-known masterpieces are his paintings of the Middle East, Italy, and Greece, produced in the late 1860s through late 1870s, which explore themes of human history and achievement. Taking a closer look at this geographical and thematic shift in Church's practice, this handsome book brings together the artist's major paintings of Athens, Rome, Jerusalem, and the surrounding region. The essays concentrate on a set of six major paintings of architectural and archaeological marvels; one essay also spotlights Olana, Church's home in New York State, which reflects the influence of Middle Eastern design. This impressive volume stands apart in its new approach to the artist's work and its quest to determine why and how this quintessentially American figure was drawn to scenery and themes from the other side of the globe. Pages: 224 pages, 125 color + 10 b-w illus.